Designed with parenthood in mind. The Dream & Grow Bedside Bassinet is a must-have during baby's first year. The height adjust feature lets you position baby perfectly next to your bed. The unique depth adjust feature extends use up to 12 months, so you can keep baby close by longer. 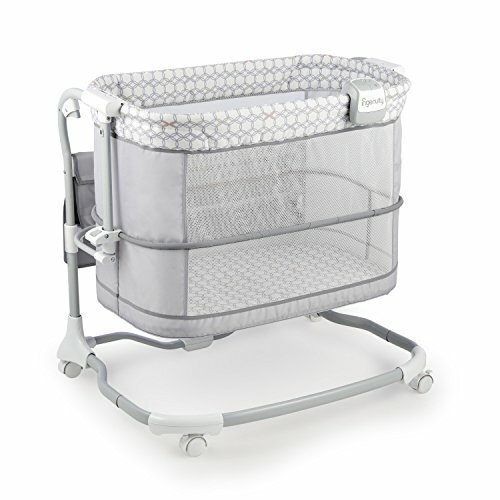 Wheels allow you to easily move the bassinet to baby's room when ready, to help baby transition while still having a familiar sleep space. Mesh panels provide airflow and keep baby in sight. The convenient soft night light makes it easier to check in on baby during the night. Help baby get sleepy with soothing music and sounds. Keep baby's necessities organized and at-hand in the extra-large storage pockets. Machine-washable sheet included.